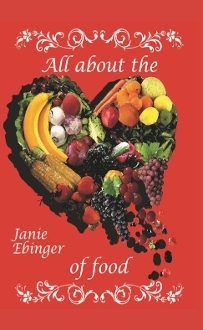 All About the Love of Food is a collection of 146 recipes created by author and chef Janie Ebinger. Inside this recipe book you will find recipes for appetizers, soups, vinnaigrettes, dinners, entree salads, relishes and condiments, vegetables, pasta, and an assortment of desserts. All the recipes are made for two servings, but can easily be increased. This is the fourth recipe book Ebinger has written about her journey through the culinary world. Her first three recipe books are about her journey through the world of vinaigrettes, entree salads, sandwiches, and wraps. They are Simply Vinaigrettes; From Ancho Chili to White Wine, Janie's Simply Entree Salads for Two, and Live Well Eat Well: Janie's Twist on Salads, Sandwiches, and Wraps.